The photo (left) was scanned from a book published in the 1930s, the photo was taken at the Centenary exhibition on the line in 1925 and shows a replica engine built for the occasion which proved capable of speeds of up to 12 miles per hour when pulling a full load. 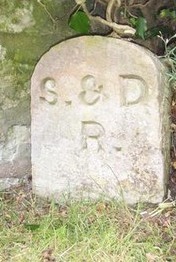 The Stockton and Darlington Railway (S&DR) was a railway company that operated in north-east England from 1825 to 1863. 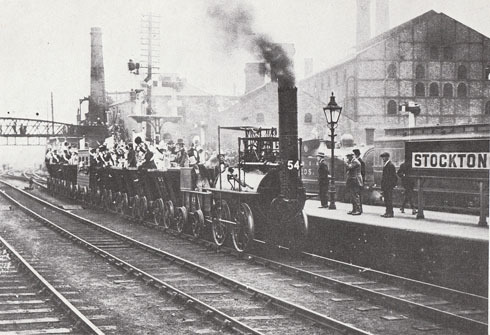 The world's first public railway to use steam locomotives,its first line connected collieries near Shildon with Stockton-on-Tees and Darlington, and was officially opened on 27 September 1825. The movement of coal to ships rapidly became a lucrative business, and the line was soon extended to a new port and town at Middlesbrough. 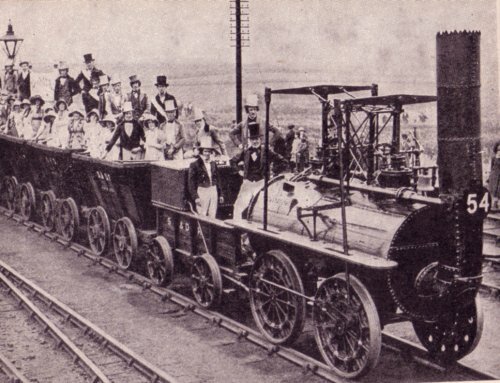 Passengers were carried in coaches drawn by horses until carriages hauled by steam locomotives were introduced in 1833. The SD&R was involved in the building of the East Coast Main Line between York and Darlington, but its main expansion was at Middlesbrough Docks and west into Weardale and east to Redcar. It suffered severe financial difficulties at the end of the 1840s and was nearly taken over by the York, Newcastle and Berwick Railway, before the discovery of iron ore in Cleveland and the subsequent increase in revenue meant it could pay its debts. 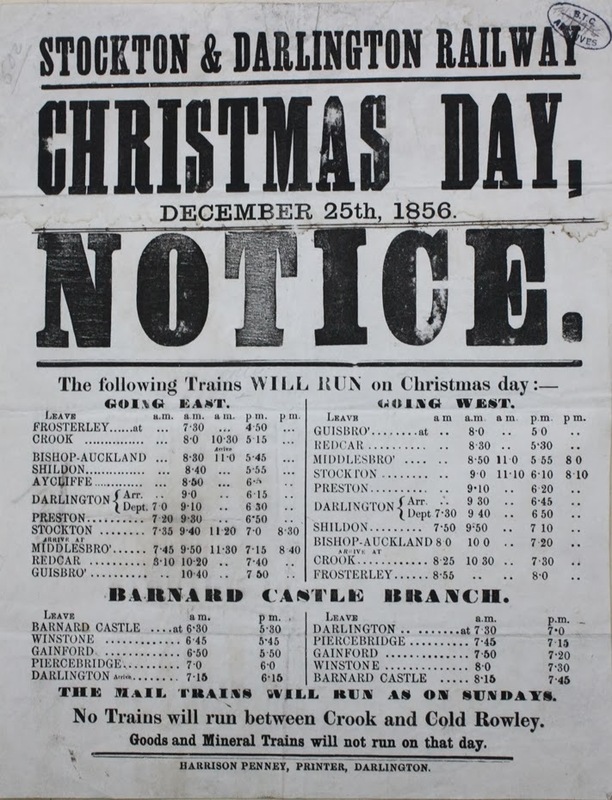 At the beginning of the 1860 it took over railways that had crossed the Pennines to join the West Coast Main Line at Tebay and Clifton, near Penrith. 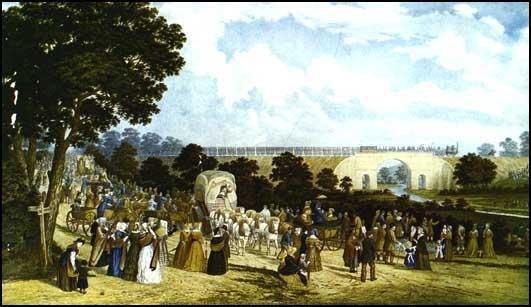 Large crowds saw George Stephenson at the controls of the Locomotion as it pulled 36 wagons. Coal from the inland mines in County Durham was taken away on packhorses, and then horse and carts as the roads were improved. A canal was proposed by George Dixon in 1767 and again by John Rennie in 1815, but both schemes failed.A few years later a canal was proposed on a route that bypassed Darlington and Yarm, and a meeting was held in Yarm to oppose the route. The Welsh engineer George Overton was consulted, and he advised building a tramroad. 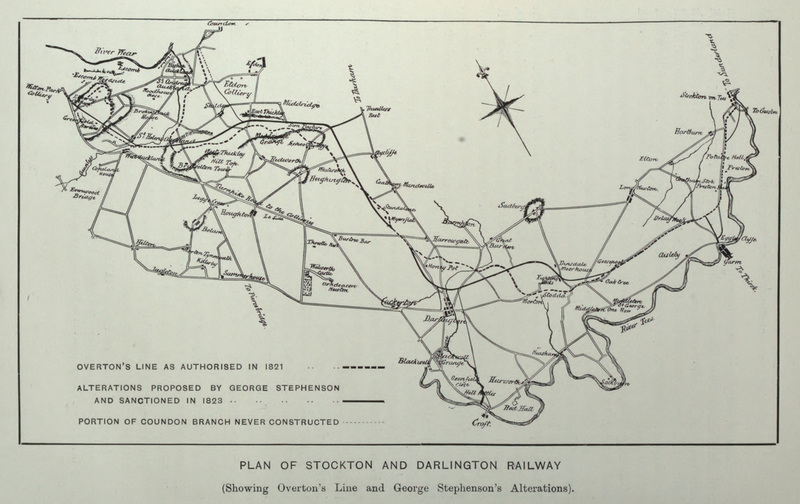 Overton carried out a survey and planned a route from the Etherley and Witton Collieries to Shildon, and then passing to the north of Darlington to reach Stockton. The Scottish engineer Robert Stevenson was said to favour the railway, and the Quaker Edward Pease supported it at a public meeting in Darlington on 13 November 1818, promising a five per cent return on investment.Approximately two-thirds of the shares were sold locally, and the rest were bought by Quakers nationally.A private bill was presented to Parliament in March 1819, but as the route passed through Earl of Eldon's estate and one of the Earl of Darlington's fox covers, it was opposed and defeated by 13 votes. Overton surveyed a new line that avoided Darlington's estate and agreement was reached with Eldon, but another application was deferred early in 1820, as the death of King George III had made it unlikely a bill would pass that parliamentary year. The promoters lodged a bill on 30 September 1820, the route having changed again as agreement had not been reached with Viscount Barrington about the line passing over his land.The railway was unopposed this time, but the bill nearly failed to enter the committee stage as the required four-fifths of shares had not been sold. Pease subscribed £7,000; from that time he had considerable influence over the railway and it became known as "the Quaker line". The Act that received Royal Assent on 19 April 1821 allowed for a railway that could be used by anyone with suitably built vehicles on payment of a toll, that was closed at night, and with which land owners within 5 miles (8.0 km) could build branches and make junctions; no mention was made of steam locomotives. 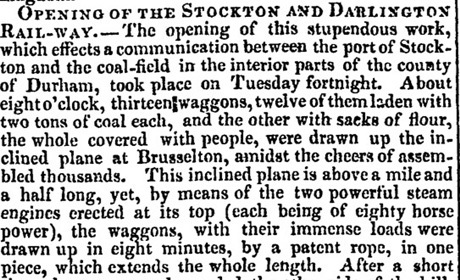 The opening of the pioneering 40km Stockton and Darlington Railway, the world's first passenger railway.